Recently, we finished converting our Sprinter van iVan, and we are now equipped to spend extended periods of time on the road. We also took the time to install a diesel heater in our van so that we could enjoy road tripping in cold weather. We decided to head into the mountains of Southwest Colorado because we haven’t explored this area much but we knew that it had some epic roads to explore, spectacular mountain views, lots of hikes and things to see along the way, and also small mountain towns to stop at for food. Our second purpose for this road trip was to test the van heater at cold temperatures and high altitude. The beauty of traveling in the off-season is that you can enjoy the solitude in places that are normally busy during summer and early fall. We really enjoy having roads, campsites and trails mostly to ourselves. There is really no off-season for me as I find there is plenty to do, and every season is beautiful in it’s own way. I love when mountains are already covered in snow but lakes, rivers and waterfalls are not frozen yet, and most roads are still open and clear of snow for exploring. We enjoy exploring new areas by taking the time and venturing on some dirt roads we find enticing along the way. Many times we do find very beautiful remote spots with awesome views this way. While this is an exciting way to explore, it’s also a good idea to know the road conditions you are adventuring on to make sure you and your vehicle are up to the task (We might know something about it ;)) I hope that my blog will provide you with some inspiration and information from our own experience. Our road trip through Southwest Colorado exceeded all expectations as we drove on some epic roads, and found lots of beautiful views of snow-capped mountains, lakes and valleys. Here are my three favorite roads that, in my opinion, are a “must do” if you are planning a road trip through Southwest Colorado. We came across this road unexpectedly as we were making our way to Ouray Colorado. It was lunchtime so we decided to find a spot with a view to stop and cook lunch and also play with our daughter. We saw the sign for the “Last Dollar Road” and decided to take it because it looked like we are going to have great views in that direction. So, I guess, we were just lucky to stumble upon it because we didn’t plan on this detour originally. I’d say that this road is a hidden gem and worth doing if you have some extra time. Last dollar Road is a rustic, bumpy dirt road that goes through a historic ranching country and will take you all the way to Telluride. It offers beautiful unobstructed views of Sneffels Mountain Range and Wilson Peak. It also would be a great road to enjoy foliage change in early fall as there is a number of aspens, but it was beautiful even with no leaves and moody weather this late fall. You don’t need a four-wheel drive when the road is dry but high clearance vehicle is recommended. The road travels for a total of about 18 miles. It normally closes around late November when the snow makes it impassable and reopens again in late May. It takes about 2-3 hours unless, like us, you stop often to take pictures or to simply enjoy the views. Because this road is within San Juan National Forest it also offers dispersed camping along the road, which is always a big bonus in our books. From Ridgway: Take Highway 62 west until you see a sign for Last Dollar Road. Turn left off of the highway and continue left when you hit a fork in the road (a right turn will take you to the town of Sawpit). Camp Bird Road above Ouray Colorado was my favorite drive during our road trip. I’ve been to Ouray once before during winter season for ice climbing when Jake and I were still dating, but we haven’t explored this area at that time. Camp Bird road follows a beautiful valley with steep cliffs and some sections of the road cut into the cliff walls, offering an exciting amount of exposure. The road gets more narrow and interesting further you go, and the drive itself definitely makes for a memorable experience. This road is only 4.4 miles long and it goes to the famous Camp Bird Gold Mine which has been around for a long time. From there it turns into a 4WD road that goes to Yankee Boy Basin or Imogene Pass and then down to Telluride. We were not able to go past the mine because the road was not suitable for our van, and there was also already snow up higher. I already can’t wait to come back on this road with a 4WD vehicle and go further to Yankee Boy Basin and also Imogene Pass. But even if we were not able to go higher it was still a beautiful and memorable drive for me. This road is very popular in summer season, but in late fall we were one of the very few who drove up there. There are also two campsites located along this road that are free and quiet in the off-season. Drive on Ouray Main Street = U.S. 550 road south, and turn just past the first switchback on the well signed Imogene Pass/Camp Bird Road (# 361). This road goes through the Ice Park. When you are back in Ouray don’t miss out on soaking and relaxing at Ouray Hot Springs Swimming Pool after this exciting drive. When we were getting ready for this trip and asked for recommendations in Southwest Colorado, a lot of people said that Million Dollar Highway is a must do. We were already planning on driving it but it made me even more excited to finally experience it in person. The stretch of the highway from Ouray to Silverton is called Million Dollar Highway and is it a popular drive because it is considered one of the best in the nation. I can’t disagree with that because this drive offers jaw-dropping views, hairpin turns, steep cliffs and some exposed sections without guardrails which make for an exciting drive. Stop and enjoy the views from the Red Mountain Pass at elevation of 11,018 ft, which makes it the highest paved pass in Colorado. At the end of this stretch of road we arrived to Silverton which is now one of my favorite mountain towns in US. This small mountain town preserved it’s authenticity and wild mountain town spirit, unlike many other towns I’ve been to, and ,for a moment, it transports you back in time. It has two main streets, one of which is a dirt road, lined with a number of western style saloons, traditional diners and other quirky restaurants. We really enjoyed pizza and especially fluffy and delicious pizza dough balls from the Avalanche Brewing Company. If you are looking for a remote and quiet campground, head to the South Mineral Campground. This area offers lots of hiking/backpacking opportunities. There is a popular Ice Lake Basin Trail, Clear Lake and South Fork Mineral Creek Falls. We actually continued further south to Durango, and it is still a beautiful drive even further south past Silverton. There were couple of passes (Molas Pass and Coal Bank Pass) worth stopping at to enjoy the views and taking pictures. Molas Lake campsite might be one of the most scenic ones I’ve been to in Colorado that are easily accessible from the road. When we opened the back doors of our van the view looked just like a painting. It was a perfect setting in combination with fresh air and warm sun to enjoy the morning. It was an awesome road trip that made us want to come back to this beautiful area again and explore more. Next time we want to get out on those 4WD roads where we were not able to take our van. Nonetheless, it was great to experience this area with views of mountain peaks covered in snow, and also with very few people around. So don’t miss out on the off-season, get armed with comfy warm clothes, hot drinks, blankets and go find some new roads and beautiful views. 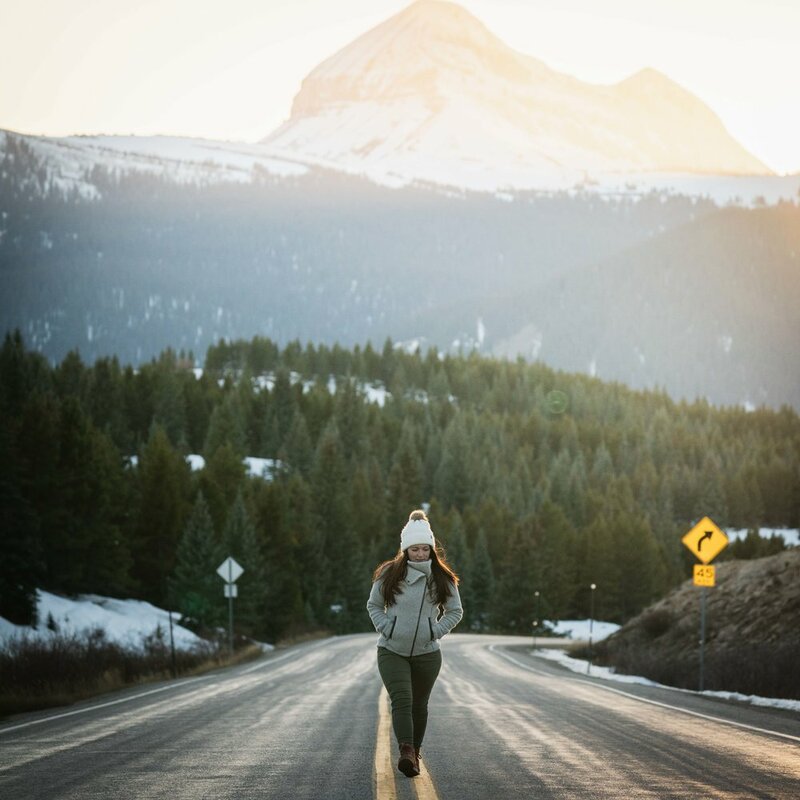 I wanted to share with you some of my favorite and essential items for road tripping and exploring in cold weather. My new favorite item that I pretty much live in this season is Backcountry Strawberry Fleece Jacket. It’s so warm and cozy that I end up putting it on every day, and I absolutely love the high collar. Chaco Sierra Waterproof Boot are my go-to casual all around boots. I don’t recommend shoes often because I am picky and have sensitive heels. I blister easily especially after summer season. I never had issues with these boots, and they were comfortable from the very beginning. This is the second season I am using them and they are still my favorite. I’ve been buying Prana pants for many years now. They are my favorite hiking pants because of the fit, and Meme Pant in particular is the one I keep wearing all the time when hiking. Backcountry Mt. Aire Sweatshirt is my new comfort item this season. I really like this sweatshirt because it’s long in the back and works great with leggings and skinny pants. I do like keeping my behind covered and warm when it’s cold outside. When we are backpacking, I am the one who carries our daughter while my husband carries the gear. On day hikes we take turns but for the most part it’s my husband who carries our daughter. The carrier we have is Thule Chariot Sapling Elite Child Carrier. We used it for a while now on multiple backpacking trips and day hikes, and we absolutely love it. I find it very comfortable, and it’s easy to adjust it for hight so that we can switch it between us. Osprey Packs Tempest 20L Backpack is seriously the best daypack I owned. I just love how comfortable it is, which I am especially grateful for on those longer day hikes. I love blankets and have a number of them (it’s my weakness). I like wrapping myself in a blanket when sitting by the fire or anytime I feel a little cold. Rumpl is my choice blanket for outdoor use because it’s compact and doesn’t get dirty easily. While we have another fuzzy blanket in a van, I never take it outside because it would immediately collect all the dirt and dead leaves and little sticks from the ground. We originally bought GSI Backpacker Mugs for our backpacking trips but now we use them ALL the time. I just love how lightweight these mugs are and that they keep our drinks hot for a long time. The North Face Mossbud Swirl Reversible Jacket is what Zoey is wearing pretty much most of the time when we are outside this season. It’s very soft and fluffy on the inside and she is all about that. Disclosure: Some of the links in this post are affiliate links. An affiliate means that if you make a purchase, I receive a very small compensation at no added cost to you. I only recommend products that I truly love, and any purchases you make help me keep this blog going. If you have any questions about products featured in this blog please email me. Thank you for your support.